I’ve endured a lot of morale boosters in my career. Management likes to think that workers are interchangeable parts, and so when they want to “reward the team” or “build the team” or “retain employees” they look for a single solution that will make everybody feel individually valued. Preferably on the cheap. At Business 1st we were given stock options as an “MVP bonus”. If the company had been worth anything this might have been nice, but we’d still need to wait 3 years for them to be fully vested. When we received them the options were worth about $60 each, but it did us no good as none of the options had vested. A year later 1/3 of them were vested, so they were stocks that we could trade or keep. They were now worth less than a dollar each. The transaction fee would cost more than they would fetch. Shortly thereafter, Business 1st was kicked off the NASDAQ index. I’d have felt better rewarded with a nice severance check. Another place I worked was a small consulting firm. I’ll call it The Workshop. The Workshop believed that employees should be excited to work extra hours for free and cast aside their hourly rate whenever the owners wanted to use the shop for PR exercises. To their surprise, there were issues with morale. To combat this they enacted a monthly lottery. We were automatically entered, and the prize was a massage. Granted that none of the workers could afford to pay someone to touch them, but that’s all manner of awkward as a reward. I asked if I could just have $20 if I won, and of course the answer was no. I told them to never enter my name in the drawing, and they said that I could give the prize to someone else. They looked hopeful. I explained that if I won a prize I didn’t want from a lottery I hadn’t entered they could pay the masseuse to twiddle her thumbs. As my friend Tim would say, the talks broke down. Lunches at vegetarian restaurants, gift certificates for specialty stores — it’s amazing how many generic rewards are actually very select and targeted. My purpose isn’t to complain. I earn a decent living, and I’ve never felt that doing my job required any more compensation than I’d signed up for. If anything I resent the waste of work time and the look of magnaminity on whatever idiot came up with the reward. Nowadays I mostly focus on not saying any of this out loud. So it came as a surprise last week when I was called in to a celebration and, in addition to the usual bland cake and bubbly, I was given an Amazon gift card. Finally, something that I could use! For a moment I even felt as though my work was valued and my accomplishments were noted. Then I raced home and put in an order for the collection of Edison’s silent films, and everything went back to normal. Still, it was kind of nice. I appreciate the gesture. Somewhere there’s a coworker wishing that we’d been given massages. 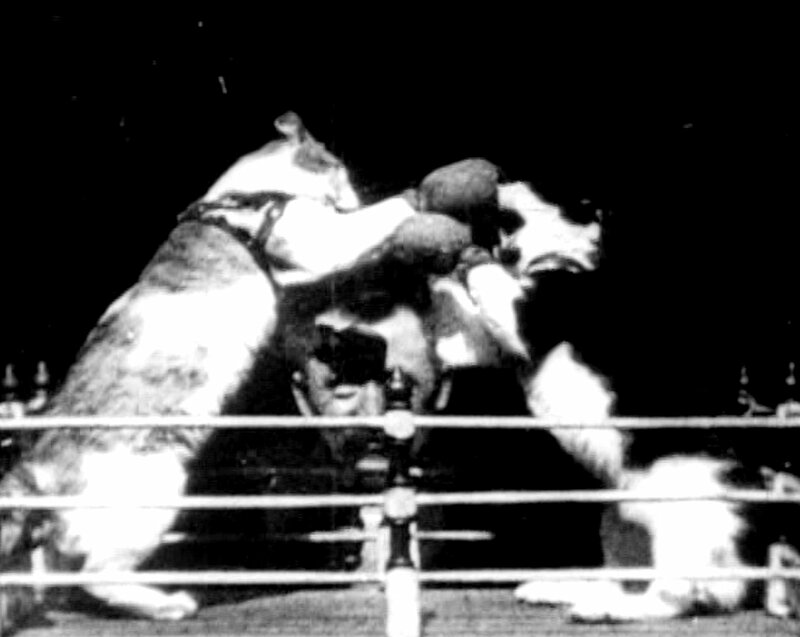 While Georges Melies created film effects and the language of film, Thomas Edison filmed this jerk making cats “box”. Guess which filmmaker died broke? This entry was posted in Work and tagged bonus, reward, stock, work by retrozombi. Bookmark the permalink. “The talks broke down.” Oh, you two! “The talks broke down” are four syllables that pack dictionaries worth of meaning into their short expressive length.